A couple of weeks ago I had a conversation with a cashier who was appalled to hear that the US was and is a socialist nation. Whether you want to believe it or not, the United States is headed more and more toward a socialist utopia. Many people think this is a good thing, but every step towards socialism is a step away from freedom. 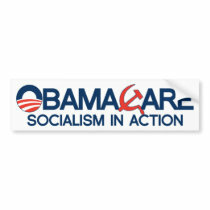 Probably the biggest leap toward socialist recently is Obamacare (ie Afordable Care Act) though it doesn't deal with healthcare as much as health insurance. There is a difference between insurance and access to care. The median wait time in Canada to see a special physician is a little over four weeks with 89.5% waiting fewer than 90 days. The median wait time for diagnostic services such as MRI and CAT scans  is two weeks with 86.4% waiting fewer than 90 days. The median wait time for surgery is four weeks with 82.2% waiting fewer than 90 days. Another study by the Commonwealth Fund found that 57% of Canadians reported waiting 30 days (4 weeks) or more to see a specialist, broadly in line with the current official statistics. A quarter (24%) of all Canadians waited 4 hours or more in the emergency room. Dr. Brian Day was once quoted as saying "This is a country in which dogs can get a hip replacement in under a week and in which humans can wait two-to-three years." What About Obama's American Health Scare Stories? Obama has spoken many times about his mother who struggled with insurance companies and cancer at the same time. However, she was fully insured. In fact her struggle was to get the deductible paid by the insurance company as well. All of her medical bills and living expenses were covered by insurance and she was left with only a few hundred dollars a month for deductibles. If Obama opens his mouth it's a lie! In fact yesterday he lied saying, "The truth is on our side." So he even lies about lying. Then again, that is what liars do. I remember the stories that he toured with while promoting Obamacare were lies too, though I cannot find them. Personal Reward motivates people to take risk and compete. Competition creates better prices and product improvements. Socialism destroys personal reward and competition. It creates a stagnant product base with decreasing quality. It doesn't matter what the industry is, substandard is the result of socialism.